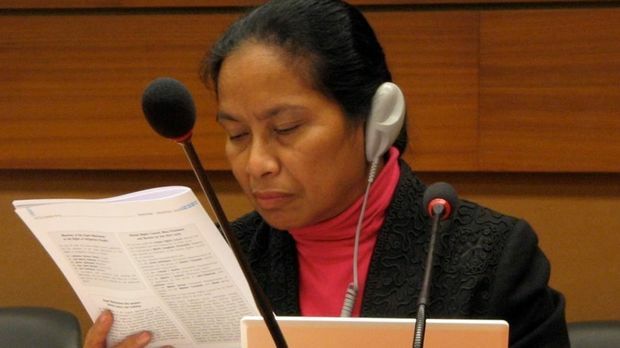 It is with great sadness that Docip has received news of the death of Pelpina Sahureka of the Alifuru People of Maluku. We are particularly sad because Pelpina was a great friend and ally of Docip, collaborating with us always with kindness and gentleness. Pelpina will be remembered as having brought the sufferings of her people to the attention of the United Nations. Her work was constant, concrete, humble and very effective. She was never one to put herself forward in the course of her work. She always behaved in a quiet and refined way. For all these reasons we will miss her very much. To her son, Ghazali Ohorella, who shares his mother’s commitment to the Alifuru People, as well as her friendship with Docip, we would like to express all our support and deepest sympathy. Ghazali, may your mother rest in peace; please know that we will not forget her.